Based near Tamworth, Staffordshire, Spline Gauges is acknowledged as one of the world’s leading manufacturers of high precision spline gauges and master gears. The company’s global customer base includes leading manufacturers and their suppliers within the automotive, defence and aerospace industries. In addition to many other applications, Spline Gauges’ highly accurate products are used within the demanding field of gear/transmission manufacturing. Since the company’s inception in 1962, Spline Gauges has achieved its leading position as a result of employing highly skilled staff, by continuous investment in the best available manufacturing plant and through the adoption of advanced processes. The company’s use of highly productive machine tools and implementation of progressive production techniques, such as lean manufacturing, has brought about the elimination of waste, helped reduce lead times and ensured that the company’s premium products remain cost effective within an increasingly competitive global marketplace. Typical of the investments made to help maintain the high quality of the company’s products is the recent purchase of a Bowers’ Ultima, high-accuracy Bore Gauging System. Keith Emery, Spline Gauges Commercial Manager explained: “As the precision of master gears’ central bores is of paramount importance to their accuracy, in accordance with our quest for continuous improvement, we recently investigated the available, high specification bore gauging systems. “Having had demonstrations of several alternatives, we bought the Ultima Bore Gauging System from Bowers Metrology. Although our new Bowers instruments proved the most accurate and repeatable of the gauges we looked at, the robust construction of Ultima instruments also made them ideal for in-process bore measurements on our master gears, whilst they are still located on our internal grinding machines. “Spline Gauges have a world-class gear and spline testing facility. In addition to certifying our own gears and spline gauges, our UKAS accredited laboratory also certifies those of third parties. As we also use the best available measuring instruments throughout our factory, this in-depth metrology experience makes us a very demanding customer when purchasing measurement equipment. “Having witnessed Ultima’s demonstration and observed the systems accurate and repeatable results when used by several operators, in light of our precision measuring experience, we were delighted to purchase the Bowers gauges. “Now in regular use, Ultima has proven very easy to operate and the system’s readout unit’s clear digital display virtually removes the possibility of miss-reading less obvious analogue scales. Although we usually operate the system in its micron reading mode, when required we are able to use the gauges’ sub-micron capability to qualify the last micron digit. With a choice of measuring resolutions of up to 0.0001 mm, Ultima is Bowers most accurate bore gauging system to date. With an application range from 1 – 300 mm, a simple lever operation and constant measuring force ensures outstanding ease of use and repeatability under pristine laboratory situations or even under harsher shop-floor conditions. 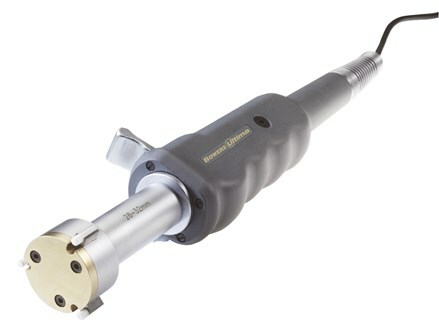 Ultima’s long list of advanced features includes Bowers’ ‘FASTFIT’ measuring heads that have extended measuring ranges, Bowers’ superior transducer technology and a range of digital readout units that give access to many advanced features such as tolerance settings, statistical analysis and multi-channel facilities. Increasing system flexibility, customers wishing to use their existing probes and readouts units are able to use Ultima’s adaptable multi-probe holder. For non-standard applications, Bowers is able to manufacture high accuracy Ultima heads for measuring previously problematic internal features such as threads and grooves. For more information on the Bowers Ultima, click here.